A great misdeed has been committed. It was the cover-up of the true fruit of knowledge. The church and the government both seek to prevent us from finding this truth because they know that it means an end to their comfort. The true purpose of the fruit of knowledge is to reconnect each one of our individual minds to God. 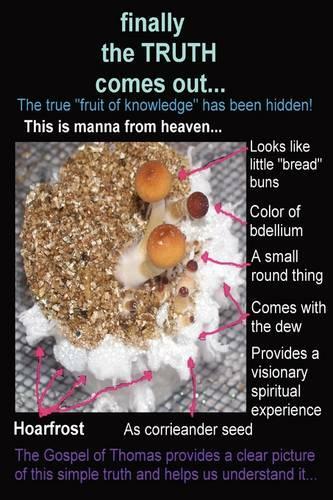 It was not forbidden by God, the church and the government forbid us from eating it because they seek to keep us under control. Break free from their deception. Awaken your spiritual mind and find God's love for yourself. This book proves that Jesus was inspired by the psychedelic experience and deciphers the Gospel of Thomas in order to complete Jesus' true message and teachings. Your eternal life depends on you reading this book.